The wonderful story of the author from his discovery of ancient memory techniques to the top of the US Memory Championship. A thorough work of research and a very enjoyable reading that you should not miss. Moonwalking with Einstein follows the journey of a journalist in his quest to understand how memory champions could memorize the exact order of hundreds of digits in an hour, while he could barely remember his shopping list. It all begins with the covering of the US Memory Championship. After the competition, he could have come back home to write his article but it didn’t happen that way. The author, a very skeptical guy, need to demystify the art of memory before. So, begins a captivating story. We follow the author through his research to find the most intelligent man, the most forgetful one, through its daily practice sessions in its parent’s home basement using the same techniques that were invented in ancient Greece, techniques that Cicero used to memorize his speeches and will lead the author to the top of the US Memory Championship in just one year! Not bad for someone that, not too long ago, can’t even remember if it has already read one of the book on his shelf. What I found interesting in this book is that is a very personal book. This is not the best book to learn the science behind your brain (check Your Memory instead) but it is the perfect book to convince you that your brain could do incredible things. 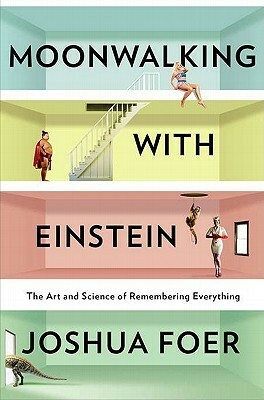 When reading these words, you probably feel skeptical about this lost art of memory, and you could not expect better book than Moonwalking with Einstein to convince you. A formidable journalism work and a very honest book. I was approaching this book with the hope to learn more efficiently. Every day, there seems to be more to remember. I read dozen of books each year to only have a foggy notion of what is was about. I could not say the book brings all the answers to my questions but I definitely recommend this fascinating and well written book. One could say that there is no need to remember anymore in our digital world, but how many worthwhile ideas have gone unthought and connections unmade because of your memory’s shortcomings?